I do not speak Albanian. I hope that this is not a problem and that I can pose my questions in English. I am interested in Albanian ethnic clothing and their origins. What is the first recorded historical example of the use of plis? What could be its origins? What is that white scarf that is occasionally worn around the neck, which reminds of the tagelmust? Did it perhaps appear as a part of clothing due to Ottoman or some other influence? Kindest regards to anyone who can bring forth worthwhile insight! A Dioscuros, Son of Zeus. Marble. Roman. 2nd century CE. German newspapers near the Conservative party of Angela Merkel, warns that Greece has destroyed even before the European order and has raised the Nazi theories, the historian Jakob Philipp Fallmerayer writes in an article, who said that the Greeks are not really Greek. According to Die Welt the critical situation in Greece is not only economic but also historical. The article says that the Greeks have destroyed even before the european economy, and that the Greeks of today are not descendants of ancient Greek, but a mix of Albanians, Bulgarians, Turks, Slavs, Rome etc. Further in the article are quoted extracts from the book of the historian Jakob Philipp Fallmerayer, "Geschichte der Halbinsel Morea Während des Mittelalters" stating that the Greek population was replaced during the period than Slavic invasions (350-800) AD. Greek race is a false ideology, but very well manipulated by them, who are distinguished manipulators and perfidies..No drop of blood flows in the veins of the Christians present in Greece, writes Fallmerayer. The newspaper goes even further proposing that membership in the European Union should be done on the basis of DNA analysis, because the Greeks who claim that are descendant of Pericles and Socrates, are nothing but a mix of Albanians, Turks, and Slavs, states the article. And what of the tagelmust, as I inquired? What are its origins in Albanian culture and when is it considered to have been brought into use for the first time? In terms of the history of these traditional costumes, you will not find a lot of material or straight answers. Some of these clothing items have had different uses in different historical eras. Please share with us here in this forum whatever new and interesting stuff you find. ....absolutely not albanian...nor european at all!! Has been brought by ottomans for the replacemant of european population sterminated and enslaved with hordes of muslim asians of Middle East! The Turks Conquered the Balkan From the Beginning of 1352 We are on the Balkan peninsula from Zeus times and earlier while you were in Rusia, northern Africa and the Middle East - there are your origins. You have to do ADN test and then you will know your origin ... This has also told German politicians-you so-called greeks are nothing else but you are a mixture of different races and people groups there are no Greeks...Through the internet, in a few seconds we can find facts from different independent sources and this makes you crazy because you can not lie more or manipulate as you have done before ... not only those who have lied, but also your founder from 1845. It was Otto von Bismark, Victor Hygo and some others who created you as a country and called you Greeks. As a result, there were no Greeks-in 500 years....No Greek history in the Middle Ages. Wondering where you were for 500 years?! What is not Albanian ot European at all?! The white scarf (turban like) or the Costume?! 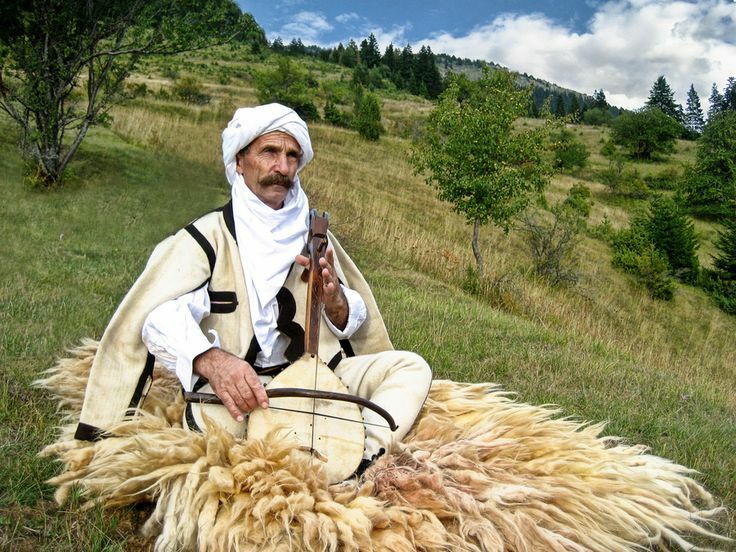 Why do Arberesh people wear the same Traditional Clothing if it truly was brought in by the Ottoman Empire to replace any authoctonous/indigenous culture?! The Arberesh emmigrated as a result of the Ottoman invasion, why would they dress something worn or advertised by the Ottoman?! While the head scarf (turban like) has in fact religious meanings, the costume itself doesn't, at least not monotheistic. Plisi has been used by many cultures, as an early form of a hat. It actually only fortifies the theory (fact) that Albanians are an old nation. By wearing such clothing it shows that a group of people (nation) has passed it on feom generation to generation. Much like Native American tribes or South American or Asian cultures. I believe that the Albanians and Basques are the only groups of people that have reserved truly ancient clothings and parts of culture. I would also admit that, of course, there are foreign influences in Albanian culture (such is the case for every nation in the World), there are many "borrowed" or instilled through invasions in the Illyrian Peninsula. But, it is surprising as well as incredible the fact that most of the parts of these customes/traditional clothing, pre-dates all of the European cultures and still lives on today. While Religions changed cultures in Europe, somehow it didn't annihilate many of the truly Albanian culture, thus being, music, clothing or tradition. What Herodotus, Virgil and Plini the Elder referred to the inhabitants of Albanian land today, reflects perfectly of the same inhabitants today. How we dress, paint our faces, of women in our society, music ect ect. An Illyrian tribe was referred to as using some traditions just like old Babylonian tribes. I will advise you in looking at Albanian archeology, you'll find out Plisi was a form of hat in many Mosaics and Sculptures unearthed . Also, read about what Heredotus, Virgil, Plini ect ect (old Historians) said about the Pellasgians and Illyrians alike. Many of the customs mentioned in their scriptutes about these people are passed on to what we know know as Albanians or Shqiptaret.